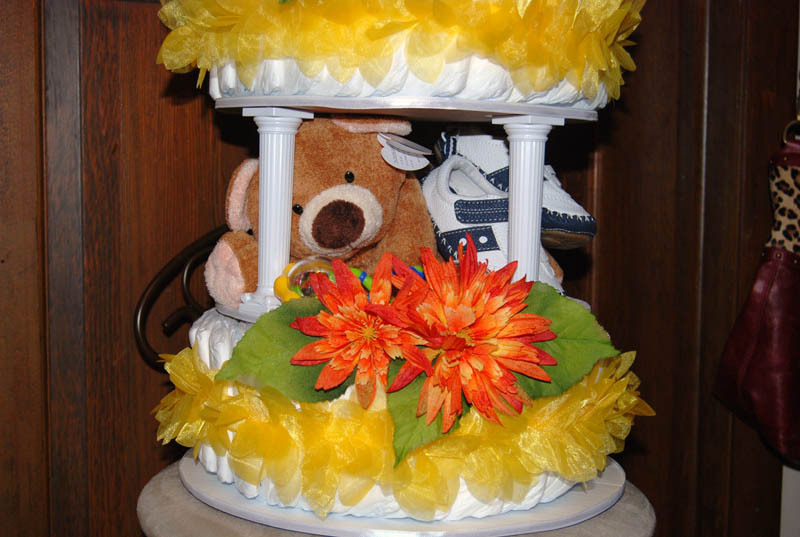 Just one look at this amazing Safari Baby Shower Cake will give you all sorts of adorable ideas for your own diaper cake. The colors are bold & bright, the ribbon is beautiful and the stacked animals are such a fun idea! And I love the pillars. 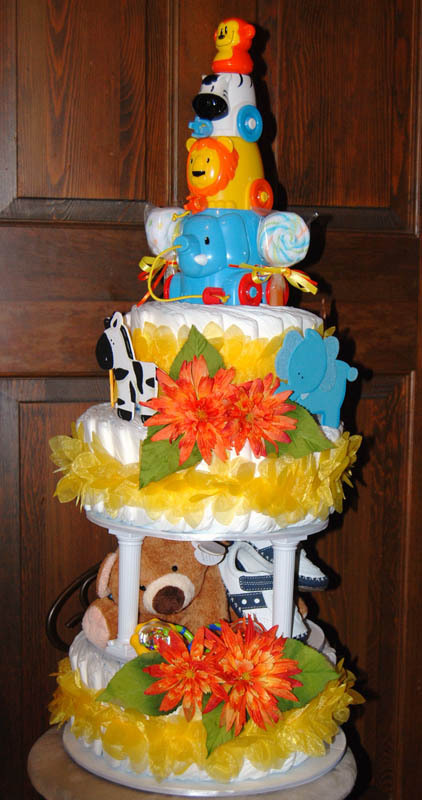 The lovely and talented Lynn Lyle made this beautiful cake and it is the 3rd diaper cake that she has submitted. ALL three of them are Gorgeous! Click here to see her origami cake. And go here to see her cute Monkey diaper cake. Lynn has inspired us many times over with her delightful ideas and her refreshing creativity. 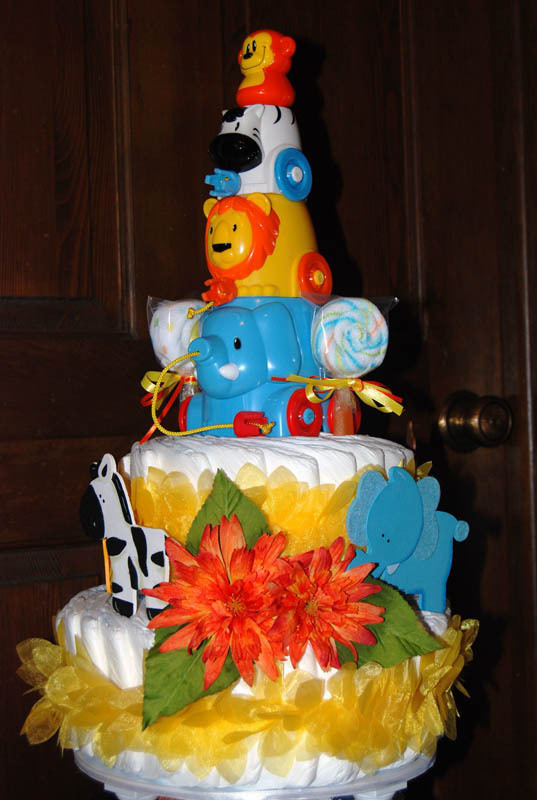 She is "paying it forward" like so many of our MARVELOUS readers who share their ideas, photos and tips of diaper cakes and baby shower ideas. Thanks a million Lynn! This is probably my favorite cake. Mostly because it so colorful. I always try to coordinate the cake with the theme that the new parents are using.This cake contained: Stackable Zoo animals on the top. Baby shoes. Lollipop washcloths. Teddy Bear. PeePee TeePee's. Baby Rattle. Size 3 diapers.The highlights of this cake, to me, are the bright ribbon, flowers and wooden embellishments.Another thing that I like to do is take a picture of the cake and use it to make the gift card. Inside the gift card I list the ingredients of the cake. This makes agreat keepsake for the parents once the cake has been dismantled. I love your website. I have sent many friends there to get help in planning their baby showers. It's wonderful to look at all the different cakes and see peoples creativity in action. Thanks for doing such a fine job. It is appreciated. Lynn, what a gorgeous cake and what useful tips!! Thank You So Much!